1. A electrode placed in the esophagus to obtain electrocardiographic records from this region or used for electrical pacemaking. 2. A pill electrode that lodges in the esophagus at the level of the atrium to obtain electrograms and to deliver pacing stimuli. 1. Relating to science of the origins and development of words. 2. A reference to or in accordance with the earliest known forms of verbal expressions either in the same language or in ancestral ones from which other terms in the same speech are derived. 1. Relating to, situated on, or joined with the outer part of something: Rainwater is collected from the external surface of the roof of Jim's house and is saved in big barrels for watering his garden. 2. Appropriate for putting on the outside of items; such as, paint, etc. : Sharon decided to use varnish on the external part of the cabinet which she was renovating. 3. Suitable or designed for use only on the outside or surface of something, especially the body: The medicine in Troy's cabinet was divided into two small containers; one for external treatment and the other one for internal medication. 4. Existing outside the body and the mind: Some people think there might be alien or external beings which could invade the Earth! 5. Affecting or entering from the outside: There were too many external pressures in Harry's job which motivated him to apply for employment in another town. 6. Of or relating chiefly to outward appearance; superficial: Stacy's father told her, “Remember, darling, the external factors of a person are never so important as the internal values that a person holds and lives by." 7. Of or relating to foreign affairs or foreign countries: Some members of parliament appealed to Britain's minister of external affairs for aid in helping the refugees who were fleeing for their lives. Descriptive of something that is occurring or is situated outside the body: An extracorporeal circulatory support unit can be a heart-lung machine, which is used primarily for animals during surgery. 1. Controlled or decreed by fate; predetermined. 2. Causing or capable of causing death: "Karla's brother died in a fatal car accident." 3. Causing destruction, disaster, or ruin. 4. Marking an important or decisive stage in a process or series of events. 5. Etymology: from Latin fata, fatum, "thing spoken (by the gods), one's destiny"; from fari, "to speak". Referring to the fibula and the calcaneus (the largest of the tarsal bones, skeletal part of the foot, which is situated at the lower and back part of the foot forming the heel). 1. Pertaining or referring to a son or a daughter: "Sharen had a warm, filial relationship, with both of her grown children." 2. Descriptive of a generation, or generations, who have descended from previous ones: "Each of the children had the filial nose which was recognizable from generation to generation." Descriptive of that which happens or comes at the end: Dr. Samuel's decision to resign from the surgery department at the hospital was his final act before he took early retirement. The plans for the final trip this summer have been completed and will take place next weekend. Did you hear what the final score of the football game was last night? 1. A reference to a somber or mournful situation which is suited to or suggestive of a grave or burial: There were many funereal emotions when Catherine attended her mother's internment at the cemetery. 2. 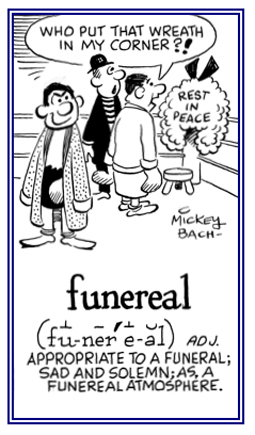 Pertaining to being very slow, solemn, mournful, or dismal: It was obvious that there was a funereal gloom and sadness when Karl's father was being buried. 3. 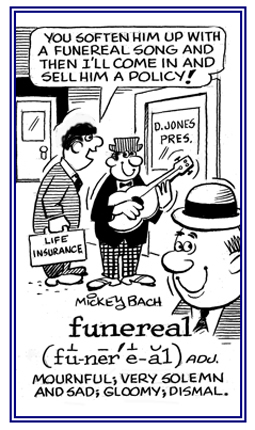 Referring to a solemn and sad occasion for the departure of someone from this life: There was a store which was stocked with several funereal kinds of clothing that would be appropriate to wear to the state burial of the former governor. © ALL rights are reserved. 1. Of or relating to a globe; such as, the eye. 2. Of or involving the entire world. 3. Considered in its entirety; with attention to the broadest view of a situation. 4. A reference to the whole world; worldwide; involving the entire earth; universal; comprehensive. 6. Pertaining to, or using a terrestrial or celestial globe; having the shape of a globe; spherical. A speech sound that is produced by wholly or partially closing the glottis (middle part of the larynx, the area where the vocal cords are located). 1. Referring to the buttocks or to one of its component structures. 2. Any of the three large muscles of each buttock, especially the gluteus maximus, that extend, abduct, and rotate the thigh. 1. Something written or drawn or engraved. 2. Relating to, or presented by, a graph. 3. Describing something with accuracy. Showing page 16 out of 20 pages of 291 main-word entries or main-word-entry groups.